HID's EntryProx™ stand-alone reader truly stands alone in what it delivers. Compatible with all HID proximity cards and keytags, EntryProx provides single-door proximity access control and is ideal for unique applications. The reader, designed to be weather and vandal-resistant, can be mounted indoors or outdoors up to 10 feet away from the control unit using the detachable antenna module. The versatile, attractive unit is easily modified to become an on-line reader by switching to Wiegand output mode, allowing it to connect to any OEM controller and provide card and PIN output. 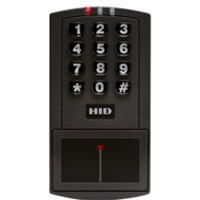 Trouble-Free Keypad Input – Extra secure keypad enables PIN entry or programming.